Beautiful, understated and very elegant. This Paloma Blanco is made of pure silk. 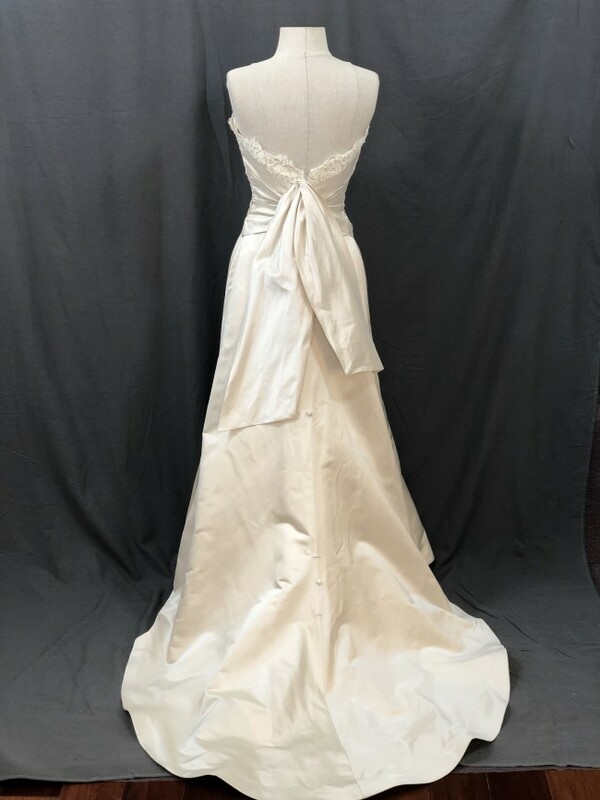 It is a silk shantung (where you can somewhat see the texture of the fabric, and it simply seems to glow) on the bodice, and the skirt is a thick pure silk duchesse style charmeuse- not too shiny, but just right. The top of bodice peeks out just enough lace. Measurements are 35"x26"x36", and length from under armpit to bottom of dress is 50". The color of this dress is actually a bit darker than ivory- I would say it is more of a pale taupe, and it picks up pale blush undertones, depending upon the lighting. It is mesmerizing! I have posted a pic here of the dress next to a pure white dress, so you can see the true contrast of color. This color will make your complexion glow! I do not know if this has had alterations or not, beyond having the bustle added (which will save you a nice bit of money, btw!) I will be adding a pic of the back of dress when bustled shortly. Gown is in excellent condition, with the very minor detail of the interior lining being slightly frayed at bottom due to being drug around on the ground. However, this part is under the silk skirt, and does not show in the least! If it bothered you, an easy fix would be to have your tailor sew on a lace strip at the bottom of the lining to hide the frayed part. The bodice is also lined in pure silk, and very luxurious to wear! I am happy to ship (almost) anywhere!